‘Tis the season to be jolly, Fa-la-la-la-laaaa! 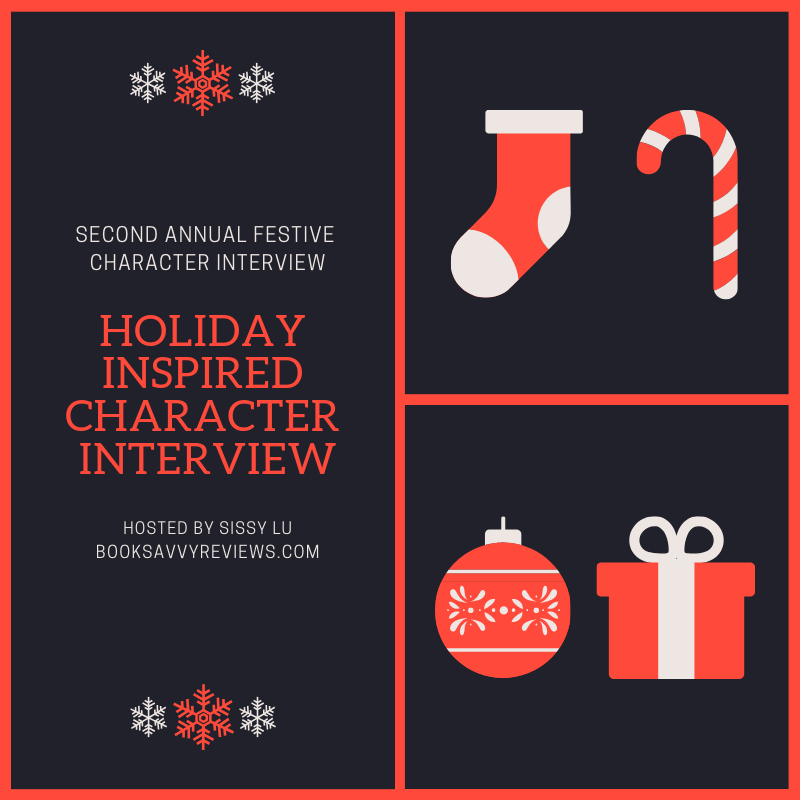 Introducing Sissy Lu’s second annual festive Character Interview, featuring Sawyer from Undercover with the Nanny. Grab a cup of eggnog or some wassail, but beware the mistletoe! Sawyer, give us some small deets below! Sure. I’m Sawyer Hayes, and I’m a DEA agent. Hm. I like all the sweets. Cookies, pies (apple is my favorite), gingerbread people. But I do like roasted turkey, too. Don’t tell anyone, but I’d really like for my wife to be pregnant! I’m ready to be a dad. 4. If you’re expected at a party are you usually on time or fashionably late? I’m on time (or even early). My first Christmas with Kate. Buying a real tree, carrying it into our place, decorating it. Great stuff. And then kinda getting carried away under the tree… you know what I mean. Me? No. But I do like what it does to Kate when she has too much. 7. There is mistletoe hanging in the doorway… are you going to kiss the person beside you or not? Oh, yeah. Even if it’s a guy. Gotta spread the good cheer, y’know? I’ll be inside. I don’t like the cold. I’m from El Paso, Texas. We don’t get snow! I would love to have a nice house to bring Kate and Bobby home to. Right now, we live in an apartment near the beach, but I’d like a home to own, with a yard, so Bobby could have a dog. A boy needs a dog to roughhouse with. And Kate needs a house to set down roots. With me. 10. What kind of shopper are you? Do you plan ahead of time or do you rush in a last minute effort? I’m a last-minute guy. I like the crowds, the sales, and all the bustle that goes with it. 11. Did you ever believe in Santa? If so, how old were you when you topped believing? When I was pretty young, I realized there was no Santa. My dad was a workaholic, who often missed Christmas. He volunteered for the holiday shifts, while other dads made an effort to stay home. So, yeah, I knew there wasn’t a Santa. 12. Tell us one of your favorite stories that revolves around this season. Last Christmas. Kate and I were newly married. Bobby was with us. We flew to El Paso to spend Christmas with my mom, who I don’t see very often. Mom cried when she saw me, and she hugged Kate and Bobby like they’d been in the family for years. Kate started crying, my eyes watered, and Bobby couldn’t believe it. Like a typical kid, he complained about all the crying. Until he went into Mom’s house and saw the stockings hanging at the fireplace. Then he started to bawl, too. I found out he’d never had a home-style Christmas. I think that was the best Christmas for all of us. We’re going back again this year, if I can get the time off. I will. I’ll make sure I do. 13. Who in your immediate circle is most likely to go caroling? Bobby. That kid loves to sing and get treats for singing. And if he starts, Kate will join him. Me? I’ll keep my singing to the shower. 14. If you could cast your acquaintances [including yourself,] in Scrooge, who would play what roles? Bobby would be Tiny Tim, Kate would be Cratchett, and I would love to play Scrooge. Oh, and my friend Ian could play Marley. He moans and groans all the time already. 15. What is your New Year’s Resolution? I’d like to buy a house. I told you I was serious about putting down roots. 16. Is there anything else you’d like to tell us? I never knew I could be so happy as I am now. I’d given up on having a family. I didn’t want to put a wife and kids through what I went through as a kid. But now, I’ve got Kate, and Bobby, and I can’t imagine not having them. It’s like Christmas every day for me. So, make sure you spend time with loved ones this Christmas. It’s the best gift to give, and to receive. And the memories will last a lifetime. Merry Christmas! Ho Ho Ho, did you know all of that about Sawyer? Bet you didn’t. Be sure to check out the author’s page as well as social media to ensure you are up to date on Sawyer and the rest of the crew! Fantastic answers! Thanks so much, Cathy, where can readers find more about you and your books?